I was worried I would not get to post today the internet was down all evening and I wasn't sure if it would work today. Yea it is! I think it must be the cold weather. It never made it to the 30's yesterday. I love thinking about angels being all around us. I created this angel with some metal, paper feathers, and dollies that I cut. The quote says; "To see an angel, you must see another's soul. To hear an angel, you must listen to both." 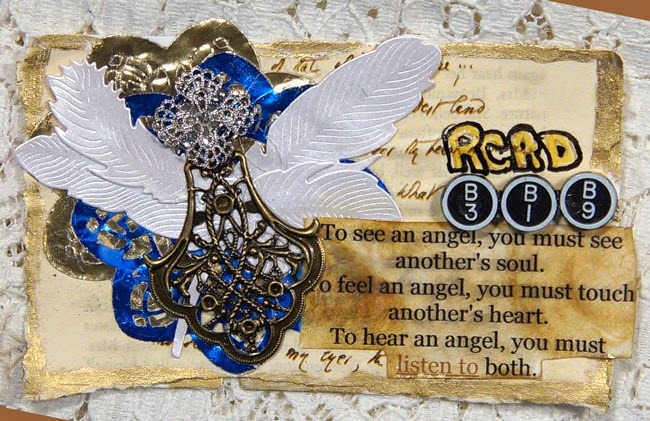 May you hear an angel today! I love angels- I have dozens of them of every size and media all over my home. Such a pretty design. Hope you stay warm and don't get lots of snow this weekend. This is so sweet!!! Love the colors and the feathers!